Petronas’ first floating LNG facility (PFLNG 1) will start operations in the second quarter of 2016. PFLNG 1 received DNV Class notation. Image courtesy of DNV GL AS. 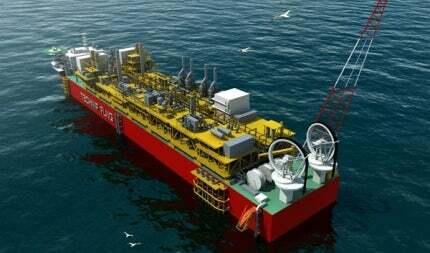 Honeywell’s subsidiary UOP delivered its acid gas removal technology for the FLNG project. Image courtesy of DNV GL AS. Petroliam Nasional Berhad’s (Petronas) first floating liquefied natural gas (PFLNG 1) facility, also known as PFLNG SATU, is developed for the Kanowit gas field off the coast of Sarawak in Malaysia. It will be the world’s first FLNG facility to start operations, upon its completion in March 2016. Supacat Multi-Purpose Vessel 24 (SMV24) is an offshore support vessel (OSV) built by Mustang Marine (Wales). The front-end engineering and design (FEED) of the facility was undertaken by Technip Daewoo Consortium (TDC), a joint venture (JV) between Technip and Daewoo Shipbuilding & Marine Engineering (DSME). TDC received the FEED contract from Petronas Floating LNG 1 (Labuan), a subsidiary of PETRONAS, in December 2010 and is also responsible for the construction of the facility. PFLNG SATU was constructed at Daewoo’s shipyard in Okpo, South Korea. The facility will be towed to its location, 180km offshore of Bintulu, in the second quarter of 2016. It will be moored at the location and is estimated to produce 1.2 million tonnes of LNG a year. Petronas has also taken the final investment decision (FID) for PFLNG 2, which is currently under construction and will be launched in 2018. PFLNG 2 will be moored at the Rotan gas field in deepwater Block H, offshore Sabah, Malaysia, and will have a capacity to annually produce 1.5 million tonnes of LNG. Petronas signed an engineering, procurement, construction, installation and commissioning contract for PFLNG 1 with TDC in June 2012. Construction of the facility started a year later with first steel cut in June 2013. The keel was laid in January 2014 and the official launching ceremony was held in April 2014, while construction was completed in March 2016. PFLNG SATU is the second FLNG development in the world after the Prelude FLNG, which is being developed by Shell and is expected to come on stream in 2017. PFLNG SATU is of the Det Norske Veritas (DNV) class and includes the floating structure, mooring arrangement and natural gas liquefaction technology. It is 365m-long and approximately 60m-wide, and weighs approximately 125,000t when fully-loaded. "It is 365m-long and approximately 60m-wide, and weighs approximately 125,000t when fully-loaded." Technip executed the detailed design of the topsides at its operating centres in Kuala Lumpur, Malaysia, and Paris, France. It provided its technical expertise in natural gas liquefaction, providing offshore floating facilities and subsea infrastructures to the FLNG project. PFLNG SATU is the first FLNG project to use the dual row cargo containment system, which enables the cryogenic storage tanks tolerant to sloshing within the hull. The FLNG facility will also facilitate the development of small and remote offshore fields in Malaysia, which have not been explored because of the high costs required to develop and evacuate the gas reserves. Air Products signed an equipment and process license agreement for the project’s use of Air Products’ AP-NTM LNG process and equipment. The parts of the proprietary equipment were built at different plants and assembled into modules to be installed in PFLNG 1. The coil wound heat exchangers and compressor-expanders were built in Wilkes-Barre and Fogelsville plants in Pennsylvania, US, respectively. The economiser cold boxes were built in Tanjung Langsat, Malaysia. Honeywell’s wholly owned subsidiary UOP provided its UOP Amine Guard FS process to remove carbon dioxide and hydrogen sulphide from the LNG feed streams. GE Oil & Gas supplied gas turbine-driven compressor train technology, comprising four PGT25+G4 gas turbine generator systems, two PGT25+G4 gas turbine driven compressor units and two electric motor driven centrifugal compressors modules, all of which will be used to cool the natural gas in the FLNG. PETRONAS Floating LNG awarded a subcontract to PBJV Group, a subsidiary of Barakah Offshore for FLNG offshore works, in February 2016. MAREFSOL designs, manufactures and delivers complete marine refrigeration systems for the shipping industry. PG Pump Solutions offers innovative pump and compressor solutions for the marine and subsea markets, as well as the global oil and gas industry. The product range is further enhanced to cover related products and applications to up-stream and down-stream the processes, including control systems, heaters/coolers, drives, agitators, start-up and commissioning of advanced systems and pump packages. Governor Control Systems (GCS) specializes in the design, installation, service, and repair of engine and turbine control, monitoring and protection equipment for marine power generation and propulsion.